University of Glasgow are leading new tests into the viability of using an innovative, new microwave system to treat human papillomavirus (HPV). The compact, portable device, which was designed by Scottish company Emblation, emits a low dose of energy, promoting an immune response. It is hoped the system will be able to treat cervical precancerous cells as well as genital warts. The device has already proved successful in the treatment of verrucas, which are also caused by the HPV virus, and has been used in more than 10,000 treatments UK-wide during 2017. The project, co-funded by the UK’s innovation agency Innovate UK, brings together Emblation with the HPV experts at the University of Glasgow’s MRC-Centre for Virus Research. Scientists are now carrying out laboratory tests with the device to find out whether it can successfully clear pre-cancerous problems caused by HPV, and will study the effect of microwaves on HPV-infected, living tissue. HPV cases are highly prevalent worldwide, with greater than 1 million cases per annum. Current treatment for HPV-caused cervical precancerous cells can be painful and invasive. It is hoped that, if found to be successful, the Emblation-designed device would offer a less invasive method of treatment. There is also potential impact in the veterinary sphere where a related virus, bovine papillomavirus (BPV) causes bovine papillomas and equine sarcoids, the leading dermatological cause of equine euthanasia, affecting 7% of horses in Europe, particularly thoroughbreds. Treatment of genital warts cost around £300 per case with around 200,000 patients per annum treated in the UK, with a total cost of around £60m. Current treatment for cervical precancerous cells involves laser surgical removal of the diseased tissue. This is painful and can cause sustained bleeding and there is also a risk that diseased tissue can be missed. In contrast, microwaving produces mild heat (less than 50 degrees Celsius) and is non-invasive. In Scotland alone, in 27 colposcopy clinics in 2016, 13,536 new patients were seen, most of whom required treatment. This translates to around 150,000 cervical precancerous cells patients in the UK whose treatment could be improved by this new device. 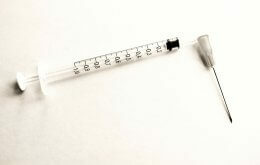 How Have HPV Vaccines Affected Cervical Cancer Screening?